Proper Body Alignment means that the joints, tendons, ligaments and muscles are in line with the pull of gravity. When the body is aligned properly sitting, standing or lying down carry no excessive strain. Patients who are immobile may experience disuse osteoporosis, disuse atrophy, contractures, reduced skin turgor and skin breakdown. Cradle boots are used to protect the heels and help to prevent skin breakdown and footdrop. These devices are made of rubber with heel cutouts. 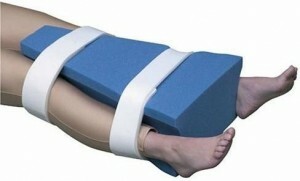 It cushions the ankle and foot without completely enclosing it. How to apply cradle boots? 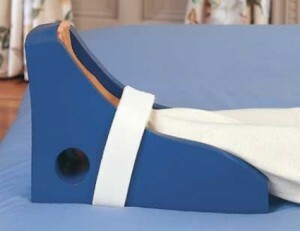 Place the patient’s heel in the circular cutout area of the opened slit on the superior surface of the boot. When the patient is on a lateral position, apply the boot only to the bottom foot and support the flexed foot with a pillow. Apply the second boot to the other foot. To prevent strain on the ligaments of the hip and pressure on the bony prominences the patient’s legs should be positioned properly. Abduction pillows are wedge-shaped sponge rubber with lateral indentations for the patient’s thighs and straps that wrap around the thighs to maintain a proper position and body alignment. It helps to prevent internal hip rotation after a femoral fracture, hip fracture or surgery. Trochanter rolls can be improvised by using a rolled towel or blankets. However, commercial rolls are made of sponge rubber. These devices help prevent external hip rotation. 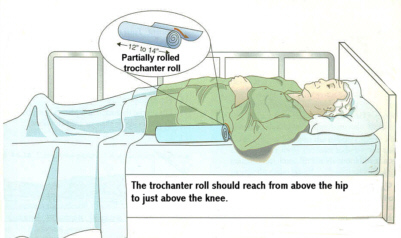 Hand rolls, like trochanter rolls, can be improvised by using a rolled washcloth that is secured with roller gauze and an adhesive tape. These devices are used to prevent hand contractures and are available in hard and soft materials.